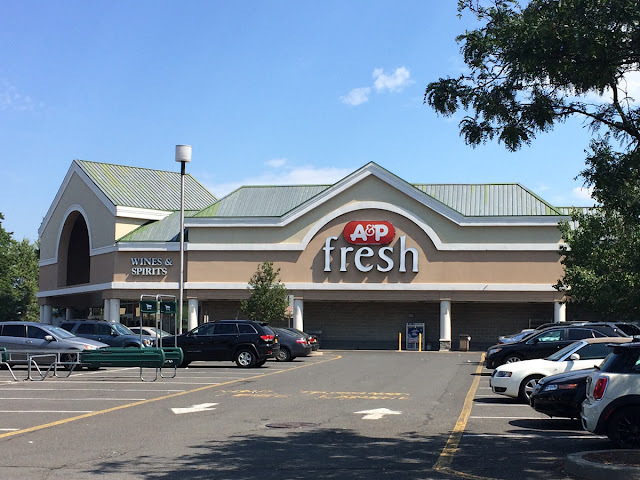 This week at A&P Preservation we're taking a look at the former A&P Fresh in the city of Fort Lee, New Jersey. For those who don't know where Fort Lee is, it's 5 miles away from Hackensack. It's a very urban town that mainly consists of high-rise buildings, and a feud over Fried Hot Dogs. I'm a Hiram's guy myself! If you're ever in Fort Lee, be sure to stop there. I know Fried Hot Dogs sound odd, but they're actually very good, and crisp. This Fort Lee A&P opened in the mid-90's as the The Food Emporium's Flagship location. It was transitioned to A&P in the Fresh 2.0 era, around 2005-2007 I'd say, and stuck with the decor and overall format until its closure in 2015. This was one of 76 locations acquired by Acme Markets of Philadelphia, who is owned by a large grocery conglomerate doing business as Albertsons-Safeway. I've said it once, and I'll say it again. Why does Acme use paint sparingly? This just looks horrible. They even touched up some of the building with the new paint on the left here. Shame! This was one of the earlier 90's Centennials, with this store opening in the mid-90's, instead of the late-90's or even early-2000's, like the deteriorating Hackettstown location. You can obviously see that the roof is in, well, "fair" condition. Acme will most likely need to repaint this store by next year. This location has somewhat of an atrium. This was definitely one of A&P's more-deluxe builds. This photo was taken inside the foyer. There is also a large window just inside the produce department, as seen in the bottom of this photo. This store got a rather deluxe version of the Fresh 2.0 decor, with a significant upgrade from the 90's Foodmarket decor that Food Emporium used. The floors were replaced in the produce department, which was a nice touch. This location, unlike other A&P's built at the time, had NO drop-ceiling in the produce department. This would be a common thing to see in the later 00's Fresh models. However, a 90's Centennial hybrid was built with the open produce department-- Pompton Lakes, which is yet to be featured on the blog. Hopefully I'll find some good photos soon! You can clearly see where the drop-ceiling starts here. Note A&P's Hot Foods station to the left here; Acme is still using it to this day. ...and their salad bar. Well-stocked, Acme! Kudos to all of the hard-working employees here. Nice Produce department here! Seafood and Meats line the back of the wall here, like a standard 90's Centennial. Checkouts line the front here. This store, unlike others, has Express Lanes first, and not last. I'm not entirely sure if Acme was able to adopt A&P's Liquor license here (hence the Wine & Beer decor above Seafood), but the store still does carry Wine & Beer. This is notable because of the fact that the state of New Jersey requires you to open a new corporation to hold more than one liquor license. A&P would often use "A&P of _____, Inc." For this particular location, it was "A&P of Fort Lee, Inc."
This store's cakes aren't displayed in the usual deli case like we've seen in other locations with this decor, but rather an upright case with shelving. An interesting choice, but it makes perfect sense. For a high-volume store like this, you can have more product out on the shelves without service! The backsplash in all of the fresh departments were replaced with the Fresh 2.0 remodel to match the paint on the walls. Unfortunately, since Acme is rapidly phasing out A&P's decor, it no longer matches! Acme uses more of a brown in their bakery departments, while A&P's was more orange. A look at the Fresh departments that run the back wall. As updated as this store was when it received the Fresh decor, A&P kept their old-style checkouts! These would have two bagging options: if you had the metal cover on top, the customer could bag via the conveyor belt. If you didn't, you could just scan, bag, and put your bags on the conveyor belt, sending them on their way! It's a lot more efficient than the connected variations of this checkout, or Ahold's crazy turnstiles. This store also had an Eight-O-Clock Coffee cafe. Acme had recently replaced the vacant space with Starbucks, which now fills the blank space on this pylon. Thanks to The Market Report for these awesome photos of the Fort Lee A&P!